The Australian Competition and Consumer Commission (ACCC) has launched a legal action against H.J. 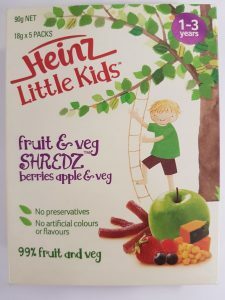 Heinz Company Australia in relation to its Little Kids Shredz product range. The consumer watchdog is arguing that the food processing company made “false and misleading representation” and engaged in “conduct liable to mislead the public” in relation to the nature, characteristics and sustainability of these products, in contravention of the Australian Consumer Law. The Shredz products’ packaging features images of fresh fruit and vegetables and statements like “99% fruit and veg” and “Our range of snacks and meals encourages your toddler to independently discover the delicious taste of nutritious food”. The ACCC is alleging that these images and statements are misleading the public that these products are of equivalent nutritional value to fruit and vegetables and are a healthy and nutritious food for children aged one to three years, which is not the case. “The ACCC has brought these proceedings because it alleges that Heinz is marketing these products as healthy options for young children when they are not. These products contain over 60 per cent sugar, which is significantly higher than that of natural fruit and vegetables – for example, an apple contains approximately 10 per cent sugar,” ACCC Chairman Rod Sims said. ACCC’s legal against Heinz follow a complaint by the Obesity Policy Coalition about food products for toddlers that make fruit and vegetable claims but are predominantly made from fruit juice concentrate and pastes, which have a very high sugar content. The Shredz product range consists of three varieties including; “peach apple and veg”, “berries apple and veg”, and “strawberry & apple with chia seeds”.